Cy-Fi Wireless Sports Speaker | OhGizmo! I’m told that it’s not the greatest idea to wear headphones while riding a bicycle. ‘Cause, you know, you might get distracted or something and slam into the side of a bus. If you’re not the type to bungee a boombox to your bike, you might be interested in the Cy-Fi wireless sports speaker, which allows you to continue listening to Le Tigre while weaving in and out of traffic and ignoring stop signs. The Cy-Fi stereo speaker system is completely self contained, weighing in at a mere 4 ounces including the integrated 6 hour battery. It comes in either an iPod version (with a wireless transmitter attachment for your iPod) or a A2DP stereo Bluetooth version. The iPod version even lets you change volume and tracks from the speaker unit itself. Although you can use the Cy-Fi just about anywhere, it was originally designed for bikes, and that seems like what it’s most appropriate for. 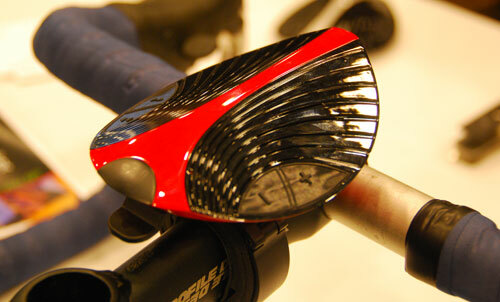 It mounts on your handlebars, with the directional stereo speakers pointing back toward you. The Bluetooth version is also great for hands-free phone calls; you can yell at it if your cell phone supports voice dialing and hold a windy conversation up until you slam into the side of a bus, which should be most entertaining for whoever is listening on the other end. The Cy-Fi speaker systems should be available online October 1; the Bluetooth version should retail for $179, with the iPod version going for $199. Cycling has never looked better than today.